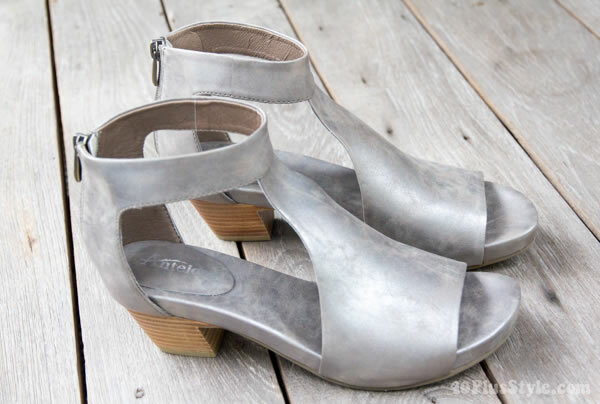 40+ Style » What to buy » Brand focus: Antelope – Shoes that are comfortable AND hip! Brand focus: Antelope – Shoes that are comfortable AND hip! I know that many of you are always looking for shoes that are both comfortable AND hip. So I was very pleased to discover another shoe brand that fits that description. Antelope shoes has been developing high quality shoes for over 30 years and proves that style, quality and comfort can actually be BFFs! When the brand invited me to select a pair from their selection, I was immediately drawn to the 486 Closed Back sandals. They are ideal for summer and are both hip and comfortable. They are perfect with cropped pants which are still very much on trend. I love the textured and shimmery feel of these shoes and they have a soft padded footbed. Antelope use only he finest leathers and materials, hand-cut with precise craftsmanship and it shows. They feel good on the feet and very comfortable to walk in. These shoes look perfect with my beloved white pants and gray top. And also with this (almost) all-white look! The other shoes I considered are their fabulous wedges. These will give you height, yet keep your feet comfortable at the same time. I love how these look with a summer dress or tunic. You can also see their creativity and innovation in their collection of clogs and mules. They look fun and modern and I can imagine they are super comfortable. If you like to try Antelope Shoes for yourself then be sure to visit their online shop. The brand ships free to the US and Canada and also offers worldwide shipping to select countries. 40+Style readers will enjoy a special code of an additional $30 off for the whole collection! The coupon will be valid until June 30th, 2015. Just click on the links and you will see the code. (be patient, it may take a few seconds). Which are your favorite shoes from the Antelope collection? The shoes are beautiful! Love the way you styled them. Those definitely look chic, cool, and comfortable! They really are Jodie. They are fully padded and have a bit of a platform so the heel is actually pretty low. Great look! I went right to the site with ease. It’s too hot in the southern US for a sandal with that much leather, but they have other styles that would work very well for us! Unfortunately the silver sandals selling on Antelope shoes are are small sizes only. I was so pleased as I really liked them. Especially the silver ones you chose (fantastic with your white jacket and trousers!). But ordering shoes from abroad… not for me. Too bad. Hi Olga. When you click on the Antelope links in the article you will see a popup on the website that includes the discount. Next post: #40plusstyle inspiration: looking great in denim – choose your favorite from 12 looks!